London, United Kingdom: IYF Secretary-General H.E. Ambassador Saeed ZAKI today announced the appointment of Petar Mladenov of Bulgaria as Regional Director for Europe. He will succeed Ms. Sofie Mohn of Norway to whom the Secretary-General is grateful for her leadership and dedicated service during her tenure. “Mr. Petar has an impressive track record working with recognized organizations and his passion for youth development will take this region to the next level.” Said Ambassador Saeed ZAKI, IYF Secretary-General. Mr. Petar Mladenov is a young leader and activist passionate about youth, women empowerment and community development. He has substantive experience in advocating for sexual and reproductive health rights, focusing on CSE and meaningful youth participation. Mr. Petar is a highly recognized youth advocate, he has represented the voice of young people at various high-level conferences and modules. 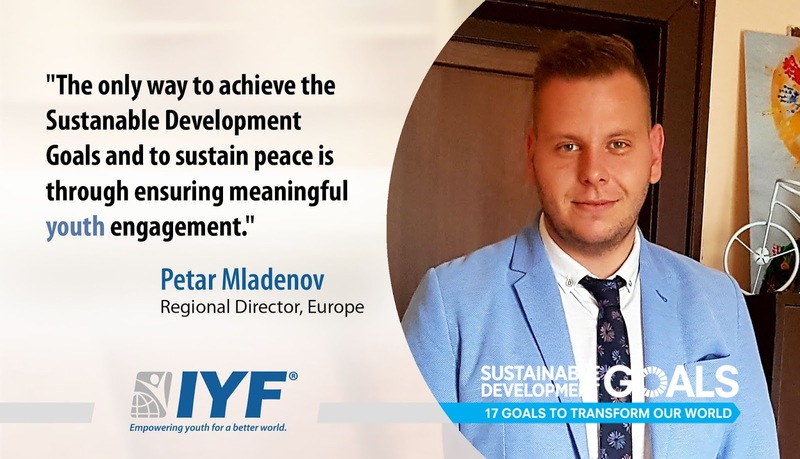 Mr. Petar was selected as a United Nations Youth Delegate and was one of the few young people involved in the inter-governmental negotiations on the SDGs, as a mandate given by the Mission of Bulgaria to the UN. Mr. Petar has also worked as a coordinator of the International Youth Network Y-PEER, and was also responsible for coordinating the youth policy related issues during the Bulgarian Presidency of the Council of the EU as the youngest chair of a working group. He has co-authored articles published within the WHO/UNFPA's magazine Entre Nous on youth-related topics. In addition to that, he was announced as one of the Top Outstanding Young Persons of the Year by JCI and as one of the top progressive young leaders at the World Youth Forum 2017. Mr. Petar holds a Master’s degree in Development from University of National and World Economy. For more information, please contact the Media Relations – Office of the IYF Spokesperson for the Secretary-General (OSSG) via e-mail: press@iyfweb.org, or visit our website at www.iyfweb.org.